There was an urban legend floating around in the 90's about black market organ trading. The legend was if you woke up in a bathtub full of ice water, call an ambulance right away because one of your organs have just been forcibly taken without your consent. Thankfully, those were just urban legends, but black market organ trading is a real and very lucrative business. Organs aren't being forcibly taken from anyone. Far from it. In fact, many impoverished people overseas are willingly selling their organs, specially kidneys, as a chance to move out of poverty and start a better life. 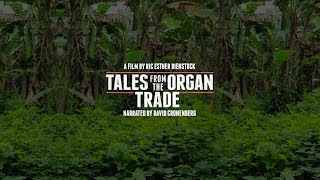 TALES FROM THE ORGAN TRADE covers three specific areas of this business: the donors who are willing to sell, the physicians who risk their careers, and the people who are desperate for a transplant. Each area could be a documentary unto itself with plenty of intensity behind teach of the stories. But this film tries to weave all aspects together into a single story with somewhat moderate success. The film is able to scratch the surface of each area, but unfortunately, it left me wanting to know more. We're introduced to many talking heads: a woman who's been on dialysis and could be waiting eight years for a kidney, a man who bought a kidney off the black market, a doctor who is wanted by interpol for using black market organs, and a young Filipino man looking for a better life for his family. Even though we revisit all of these people throughout the film, it randomly interjects others for a quick anecdote, such as a healthy man donating a kidney to another he found on Craigslist or a Filipino man who donated a kidney but ended up with complications in his other so now he needs a transplant. The result ends up feeling very unfocused. With documentaries, the subject matter is what drives the film. Any part of black market organ trading warrants a discussion. There were such eye-opening facts about organ lists and regulations, that you could easily sympathize with the desperation of these people needing organs. It's a complicated world most of us were not familiar with. But with it being so complicated and dense, it just ends up leaving more questions than answers. The film also ends on a strangely jarring statistic that felt politically driven, and left me confused at what the purpose of the whole film ended up being. Was this supposed to show light on this world? Or are we supposed to take a stance on whether people should be able to sell their organs for money? Overall, the film has moments of enlightenment and humanity that makes you sympathize and understand every side of this issue. Plus, David Croenberg's narration adds some very well placed gravitas during scenes. But the film ends up trying to reach for too much within one film.